The line I waited in to get into the Met last Sunday. I returned to the Met for the Alexander McQueen: Savage Beauty exhibit with a friend on Sunday morning to see it one more time before it closes on August 7. The line at 9:30AM when the Met opened was actually two lines, which snaked down the steps and along Fifth Avenue in both directions. I’ve lived in NY since 1996. I’ve gone to the Met more times than I can remember. I have never seen a line for anything in Manhattan like the line not only to enter the Met, but to get into the McQueen exhibit! The Met has announced they’ve had 500,000 visitors to the exhibit since it opened on May 4. Wow! They have also announced that they will extend the viewing hours until 9PM for the last four days of the exhibit, August 4-7. In addition, starting today, July 22, the Museum will open one hour early to Museum members, offering exclusive entrance to the McQueen exhibit from 8:30-9:30AM, every day except Mondays, when the Museum offers McQueen Mondays, with a timed ticketed entry to the exhibit and with the rest of the Museum closed to the public. If you get to the Met and find yourself, as I did, standing in line in the Near East Art galleries, you are about 2 hours from getting to see the McQueen show. In which case, I highly recommend buying a membership to the Met (prices start at $100), because members don’t wait in the line, they can go straight in, and bring guests with them as well. The handsome Lloyd, whom my friend and I met in line when we offered to hold his spot so he and his friend could check out the other exhibits in the Met, decided he’d had enough of waiting. He bought a membership at the table strategically placed just outside the McQueen exhibit, and then brought his friend, my friend, and me in as his guests. Thank you Lloyd! That’s the kind of random and wonderful generosity that makes me love New Yorkers. I want to thank you, Jill...of course, I will not be up there before the exhibit ends, so you sharing it with us is the closest I will probably get...I really appreciate all of the posts you have done on the exhibit...I have loved your pictures and commentary...THANKS from us all!! Oh, your own kindness paid off...and I am certain it was a memorable exhibit. Wow! 500,000 visitors that's awesome. That's such a blessing that you were able to get in to see the exhibit and not wait a long time in the line. I know you enjoyed the exhibit greatly. What an incredible exhibit and I wish that I could see it before it closes. Your photos and commentary have been the next best thing! I did this with the V&A to see the Christian Dior exhibit in London - it was sold out on the last day (on which I arrived to see it) but members get in all the time. Best decision I made. Hope they bring this exhibit to London. Hi Pam, thanks for your kind words. It has been my pleasure to share this exhibit with people who can't see it for themselves. Hi Terri, my friend and I were happy to help Lloyd see other parts of the Met while we held his place in line and it was fun to see the exhibit with so many people, all very polite! Hi JTWisdom, I can't wait to read about the final numbers on the McQueen show in terms of how many people saw it and how much money the Met made. I'm sure the figures will be as stunning as the exhibit itself. Hi Genie, I'm happy to share this exhibit with you like you have been sharing Paris with me (and all of us)! Visiting your blog for a little hit of Paris is like having a wonderful macaroon (make mine passionfruit). And I'm with you, yay for Lloyd! Hi Veshoevius, I love that you got into the Dior exhibit by buying a membership to the VC&A! I wonder if you will be going to the exhibit to see Kate's wedding dress? I hear it is now on display. Talk about a show that will be sold out. 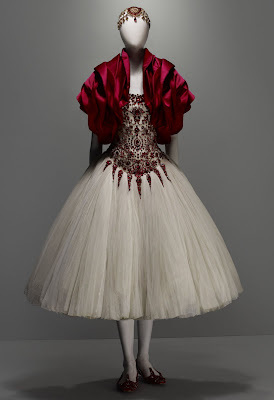 If I get a press release that the McQueen exhibit is going on tour I will let you know. What a divine day! I bet it was as magical as that ensemble. Love live McQueen in our hearts! Hi Catherine, I'm so glad the McQueen brand will go on, I saw some of the Fall collection Sarah Burton did and the formal gowns are amazing, just unbelievably beautiful, both the design and the fabric.